Lilabelle Lane: and the binding is done! and the binding is done! to get the binding hand sewn on these but at last they are finished. I am keeping one for myself and the other three are gifts. Miss Lily has already picked who is getting which one. Now just need to wrap them. I have also made a start on my Hoop-la-la swap item. I have used part of Leanne Beasley's design for the Vignette Mystery Quilt. Not sure it will be the design I send out but only time will tell there. Still playing with hoop size too and what will I do with the hexagons? 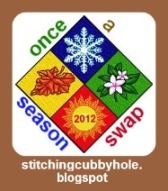 Also Cheryll is hosting her last two swaps for the year if you would like to come and play along. Christmas there for the Mini and Summer theme for the Once a Season Swap. For all the details pop on over here. It just does not want to to its thing for me this morning. Might need a coffee first though. They look terrific all finished. What a difference a little binding can make. You are organised. Love the christmas table runners. Have joined in the Mini..
Hope you fix your e-mail problem. Excellent job and Christmas is almost here....yikes! Those table runners are just beautiful! Oh they are so lovely Sharon well done...sweet block too. They look great and a nice idea for a present! Love all four runners Sharon... they are simply gorgeous! your table runners are sooooo lovely !! These are so gorgeous -- perfect for gifts! I love the way you quilted them too!